No rig too big or small, tents welcome. Park like setting with heated pool, laundry, cable TV, wifi & private nearly 1 mile walking trail. Restaurants, shopping, fishing & golf nearby. The ideal overnight stop or summer home. 7300 miles, 14 states, and 12 national parks so far this trip. This is the best park we have stayed in. Great staff and a well cared for facility. Will be back next time we are out this way. A wonderful place. The staff is friendly and helpful. The grounds are very nice and the sites are spacious compared to other parks we visited. Deer are abundant and we even seen turkeys on the grounds. It is a quiet place to stay. Cell service is good, however the parks WIFI is just barely OK very S-L-O-W, my phone connection to the internet was much better than what the park offered. 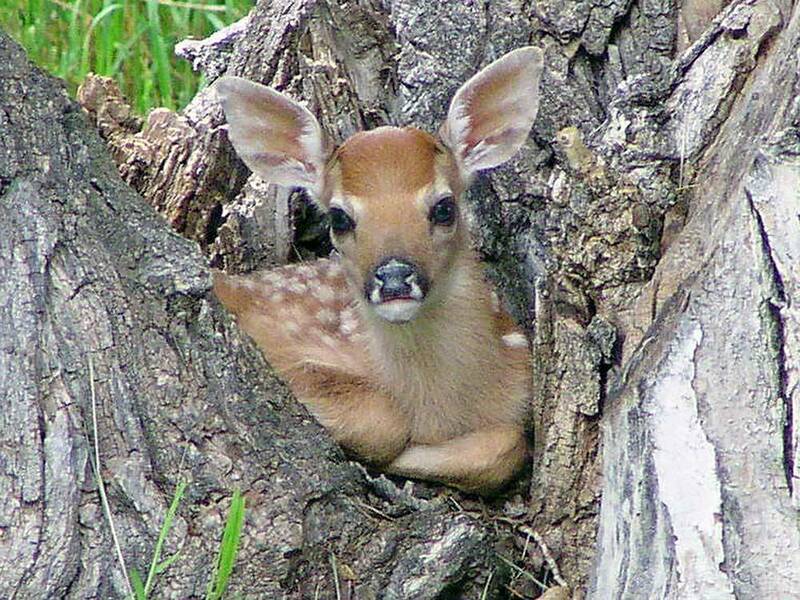 I would give the park a 5 star rating, but the WIFI is horrible. We have been camping in various sites and Deer Park surpasses all of these on this trip. There is decent space between the campsites and there are lots of trees. The staff is friendly and very supportive in helping to make our camping experience memorable. We traveled with our dog that the staff welcomed heartily. The rates and accommodation were very reasonable. Beautiful peaceful park with many shade trees and lots of birds, deer and chipmunks. Easy level gravel pull through site. Clean restrooms, showers and laundry. Helpful friendly staff. Even a walking trail to see the deer. We'll be back. This park was first rate in all respects. We were there for two nights in June 2017, and really enjoyed our stay. The sites are large for large rigs, and the roads are wide making getting into your spot easy. Not right next to your neighbors. Great WiFi, and staff was awesome. We can't wait to come back for another visit! RESTROOMS ARE IN NO WAY A 10! THEY ARE CLEAN BUT THE SHOWERS ARE RIDICULOUSLY SMALL!!!!! NO RING FOR FIRES OR GRILLING. 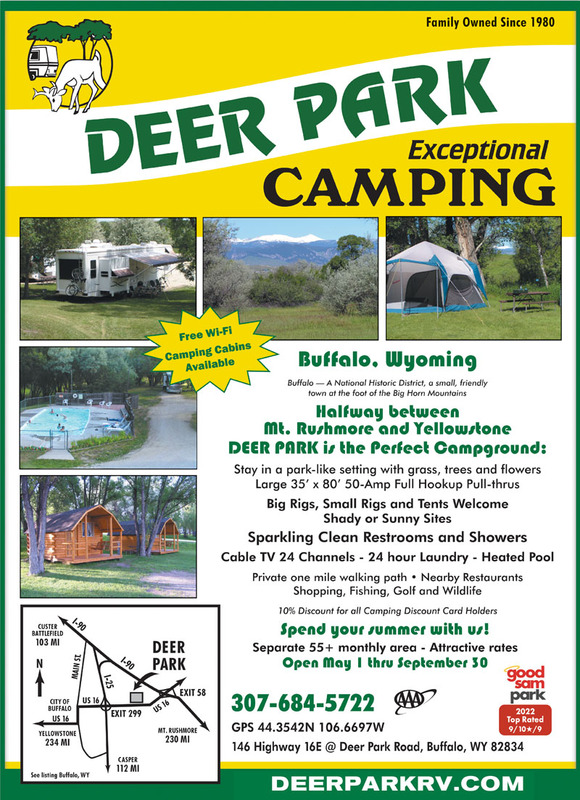 RV park near intersection of I-25 and I-90 in Buffalo WY, with easy access from both interstates. We stayed a month and thoroughly enjoyed the campground and the surrounding area. They have a separate area for the longer-stay guests with very spacious pads and shade trees. The monthly sites are back-ins (lots of room to maneuver); the overnight sites are mostly pull-throughs. Buffalo is a great small town to visit and the surrounding area is rich in Western history. We happened to be there for "Longmire Days" and had a blast. The campground roads are dirt and can be very very dusty when hot, but they sprayed treatment on the roads when we were there which cured the problem. Both WIFI and cable were good. The pool was kept clean. The management was friendly and helpful. Clean restrooms and laundry. Overall, our experience was very good, and we would definitely return. Excellent campground. Very nicely laid out and landscaped. Extremely nice and helpful folks in the front office. Stayed here 3 nights in July on way to Yellowstone. Sites are large and spacious easy in and out. Just a very nice place to stay and conveniently located to all things in and around Buffalo. Would stay here again.